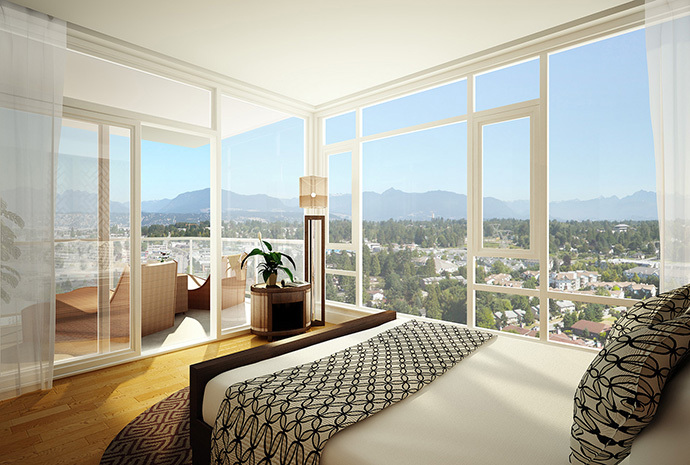 The Vancouver Condo Buzz » From $183,900! Launch at PARK AVENUE Surrey City Centre Condo Towers by Concord! 250 Premium Resort Style Surrey Park Avenue Apartments Priced Under $250k! Club PA Amenities and Great Location! « Only 40 Available! Launch at the South Surrey Laureates Walk Townhomes at the Master Planned Harvard Gardens Surrey Community by Polygon (top builder!) > 2, 3 and 4 Bedroom Townhouse Floorplans plus access to Exclusive Rowing Club at Harvard Gardens Amenities! From $183,900! Launch at PARK AVENUE Surrey City Centre Condo Towers by Concord! 250 Premium Resort Style Surrey Park Avenue Apartments Priced Under $250k! Club PA Amenities and Great Location! Park Avenue Surrey Condo Grand Opening! Exclusive VIP previews are happening on June 18, 2013! So don’t miss out on this incredible opportunity at Park Avenue Surrey condo tower development by Concord, one of our favourite master builders in the Lower Mainland! Featuring incredible pricing and an even better Surrey City Centre location, the amazing condominium high-rise towers at Park Avenue Surrey condos will be launching a brand new 8,000 square foot presentation centre completely with stunning design, a floating marble staircase, state of the art technology, interactive model and two beautiful display homes. 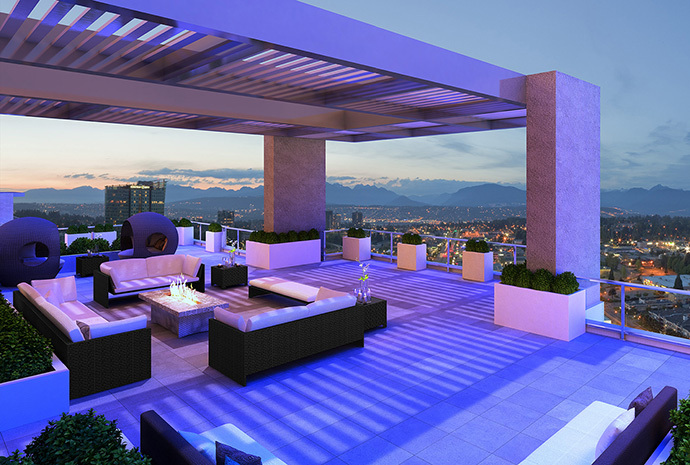 We’ve checked out all of the presales grand opening launches in the Surrey real estate market in the past decade, and NO OTHER CONDO PROJECT compares to the new Surrey Park Avenue condos! This is the most highly anticipated VIP launch of any Surrey City Centre condo project this year and will offer homebuyers a chance to live in a resort style community that includes 250 homes priced under $250,000! 1 bedroom Park Avenue Surrey condos for sale with oversized balconies will start from just $183,900. More than half of the homes will be priced under the mid $200’s, making them a truly affordable opportunity for any home buyer or investor. The Park Avenue Surrey City Centre condos represent the best priced concrete high-rise and the best value in the Lower Mainland. Centrally located, Park Avenue condos in Surrey City Centre real estate market are just minutes away from the SkyTrain station, Central City Mall, SFU Surrey Campus, Holland Park and the new Surrey Library. Not only that, but the new Surrey Park Avenue condos will feature the best of resort amenity spaces never seen before in this city. 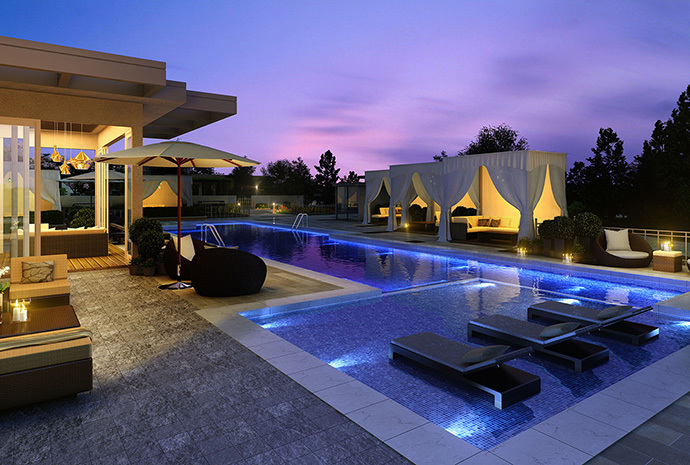 Club PA at Park Avenue Surrey will be a complete amenity club designed for the ultimate resort experience. More information is online at www.parkavenueliving.ca where you can register your interest and sign up for the VIP previews. Please note that any features outlined in this blog article are subject to change at any time. The interior specifications at the Concord Park Avenue apartments in Surrey real estate market are superb. There are 4 interior colour choices that are called the Hamptons, Manhattan, Reflection and Impression. There are spacious open balconies or terraces for all homes here in addition to bedrooms with carpets. 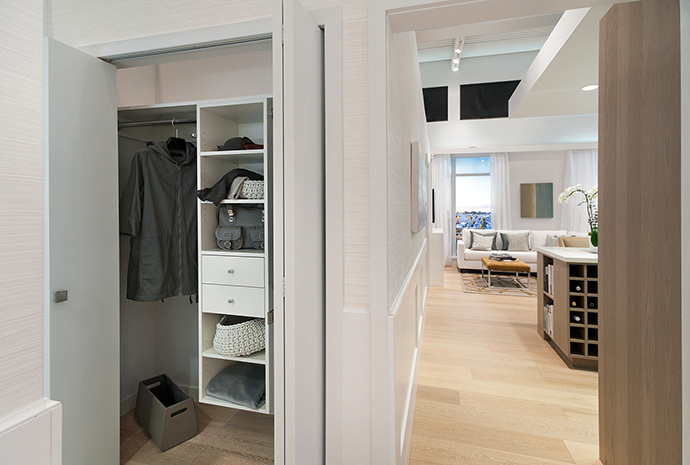 The interior suite and closet doors are trimmed and there are closet organizers for closets that are wider than 48”. Those that are not this wide will have shelf and rod finishing. As well, all presales Surrey Park Avenue apartments will come with stacked front loading washer (EnergyStar rated) as well as dryer. All principal rooms have TV and telephone jacks and most if not all window coverings have Venetian blinds. The presales Surrey Park Avenue apartments for sale will also feature full length walk in shower stalls as per floor plan with partial frameless glass enclosures. Homebuyers looking for a fabulous entertainment and cooking space will not be disappointed. The pre-sale Park Avenue condos in Surrey will feature 24” appliance package in the 1 bedroom homes and 30” appliances (except a 24” dishwasher) in two bedroom and larger floor plans. 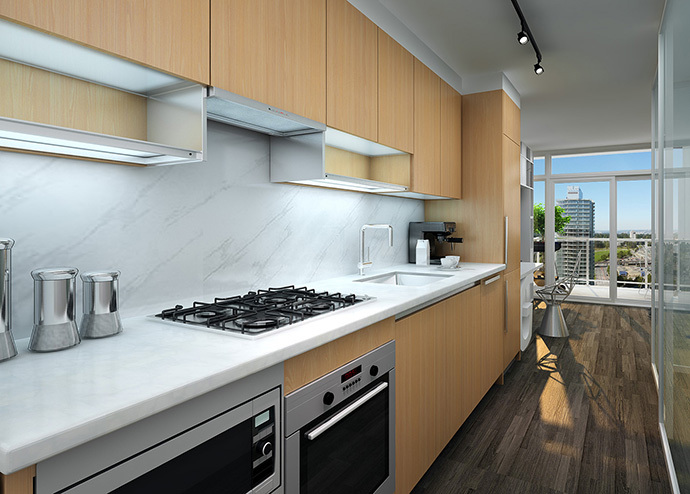 The integrated appliance package at the premium Surrey Park Avenue condos include a bottom mounted counter depth fridge with integrated panel, a wall oven, gas cook-top, hood fan, microwave with trim kit and a dishwasher also with an integrated panel for that sleek and modern look. 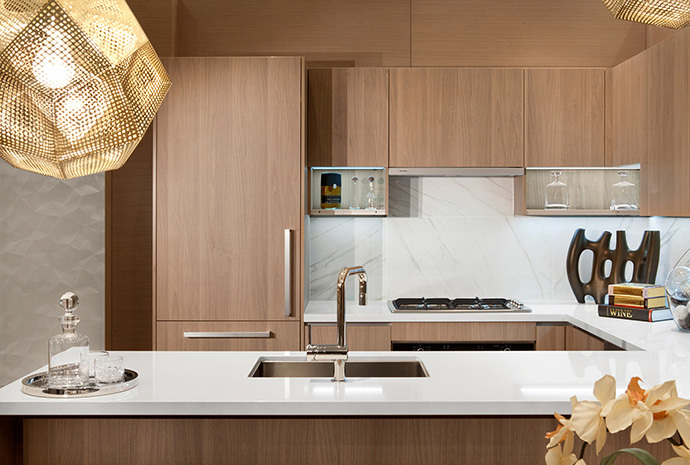 The gourmet kitchens at the Park Avenue condos in Surrey City Centre will also feature polished chrome Kohler faucet with lever handle and pull down vegetable sprayer in addition to a large single bowl stainless steel under mount sink that has a large capacity. Also standard are large format marble tiled backsplashes in addition to premium engineered stone (quartz) counter tops. 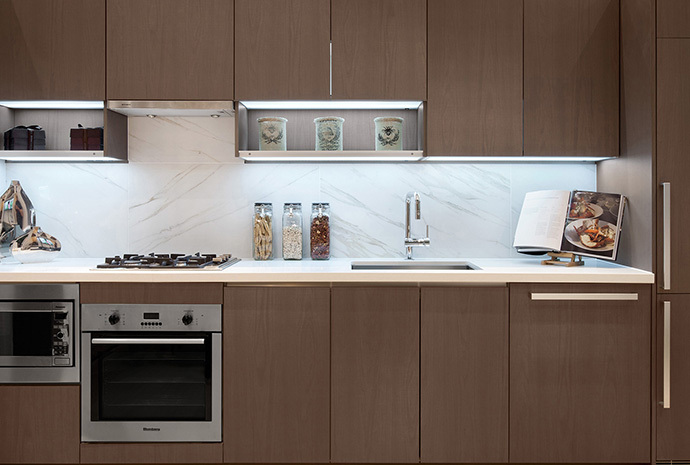 Other kitchen features at the pre-sale Park Avenue condos in Surrey include laminate cabinets with open glass display shelves and under cabinetry valance lighting to light up your work space and for that warm ambiance. The cabinetry also features soft close hardware, and kitchens will have waste recycling bin and sliding basket under the sink. Some kitchens will have a magic corner for better functionality. The main bathroom or ensuite bathrooms as per floor plan will feature a laminate vanity with soft close hardware, polished chrome Kohler faucet, shower head and tub spout in addition to a dual flush water conserving toilet that comes with a soft close seat as well! 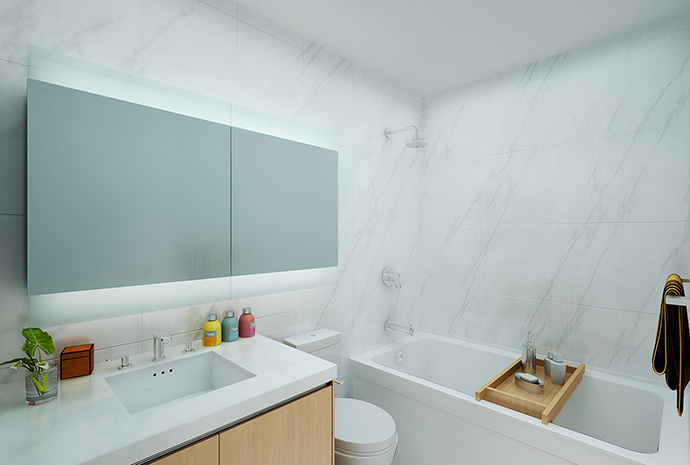 In addition, the main bath/ensuite will come with a custom medicine cabinet with built in lighting, shelves for extra storage space and a mirror. Other premium features include engineered quartz counters like the kitchen as well as under mount sink with polished Kohler faucet (chrome finish). The tub/shower surrounds and the floors are of large format marble tiling. 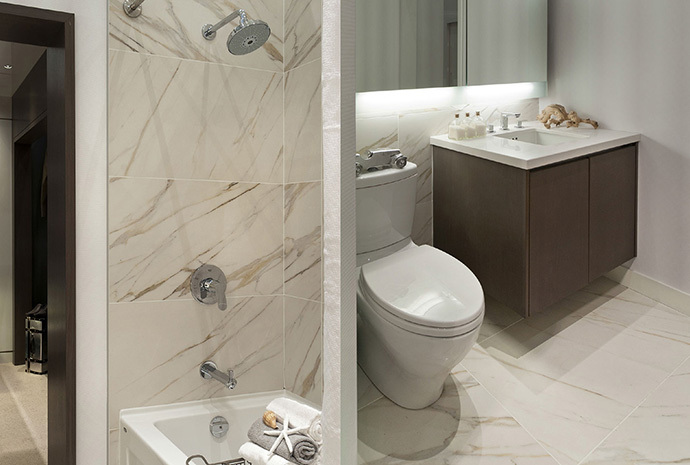 The 2nd bathrooms wherever applicable at the luxury Surrey Park Avenue condos will feature walk in full length shower stalls with partial frameless glass enclosures as per floorplan in addition to mosaic marble tiled shower floor and surrounds. Other than that, the extra bathrooms will also have the same premium features as the main bathrooms. Join Park Avenue Surrey for a lunch or afternoon tea session on June 18, whichever suits your schedule best. 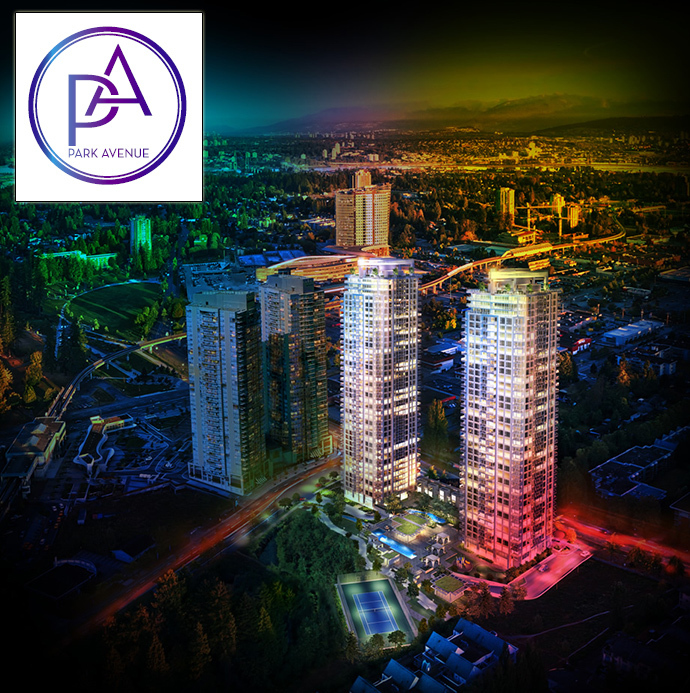 CLICK HERE for more information about Park Avenue Surrey City Centre.